LoRa stands for 'Long-Range,' referring to a modulation technique whose specialty is low power transmission of small data packets -- perfect for Internet of Things applications. Using either point-to-point radio or LoRaWAN you can send data from a node in a remote location back to your base station to check in on sensors or track equipment. Communication is possible in the other direction as well to send commands or control actuators! This is the updated version (x02) of the original. We've removed the battery charger so that you can now power it with up to 15 volts in the field, removed a redundant U.FL connection for cleaner RF output, and most importantly exposed the flash memory on a separate SPI port. This makes the board compatible with Micro/CircuitPython while still being able to run the radio module. 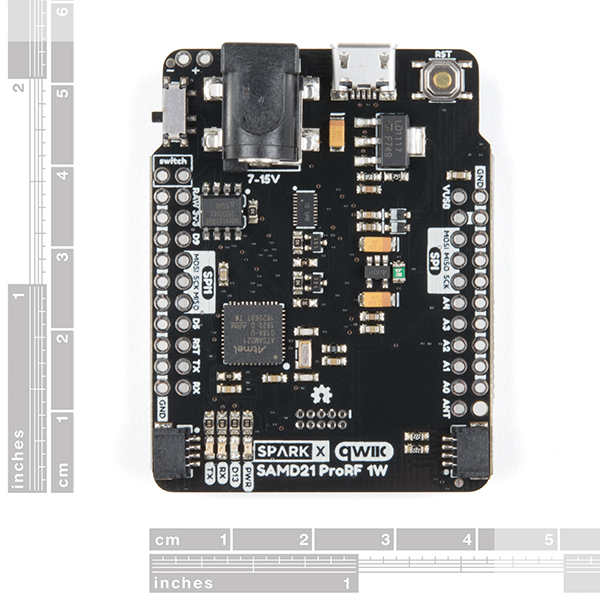 Like the LoRa®-enabled SparkX Pro RF this board is based on the Semtech SX1276 transceiver, but the module boasts a whopping 1W output power. All that extra oomph makes it possible to send small messages up to 9 miles using common rubber-duck type antennas. 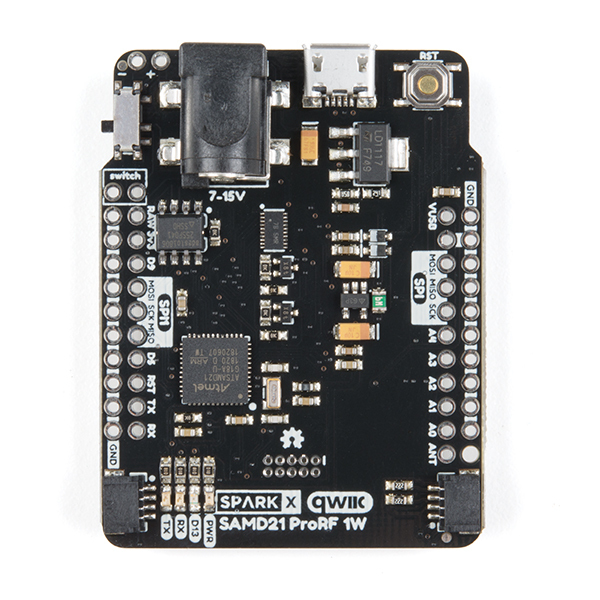 In addition to more transmission power the SparkX SAMD21 ProRF 1W gets more computational power courtesy of the SAMD21 microcontroller running at 48 MHz. We used the additional GPIO pins to permanently enable LoRaWAN signals. 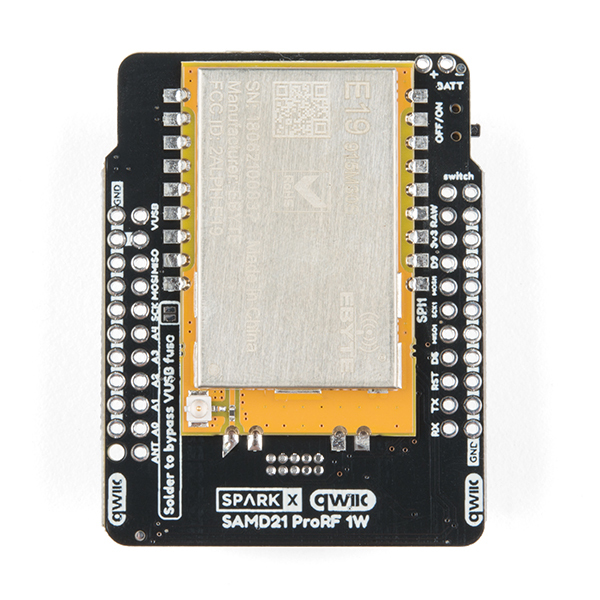 This means more pins for you to connect to sensors and actuators, even when connecting to a LoRaWAN network like The Things Network. 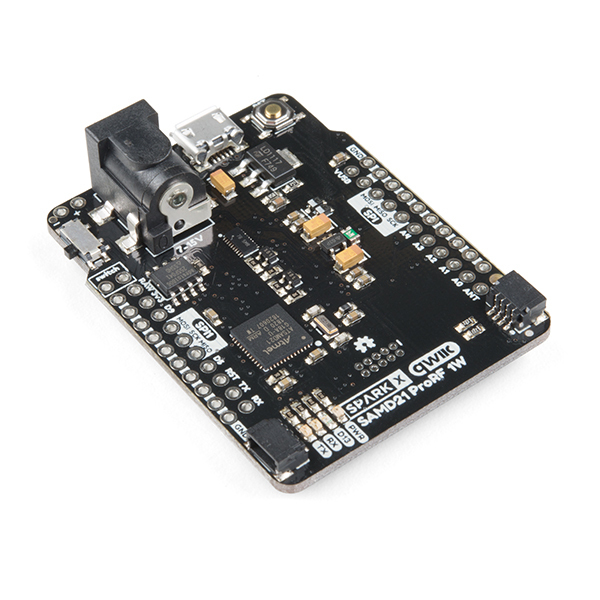 Checkout the SAMD21 Mini/Dev Breakout Hookup Guide as a general starting point for the SAMD21 Pro RF 1W. To get you started we've included some basic Point-2-Point examples. SPI Silkscreen Mis-label The top side silkscreen tag for SPI (not SPI1) should read MISO MOSI SCLK from left to right. (Instead it reads MOSI MISO SCLK). The labels are correct on the bottom side.